For over a year, I have been looking for the deed of the Believers’ Church trust. I wanted to find it because I felt sure that it would demonstrate that CEO and founder of Gospel for Asia K.P. Yohannan was on the board of Believers’ Church. 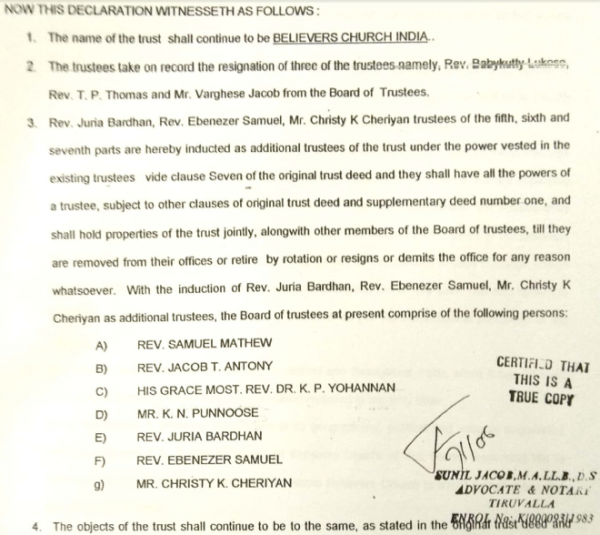 Since Yohannan once claimed he didn’t sit on any controlling boards in India, I wanted the trust document to check on that claim. More recently, a lawyer defending Gospel for Asia against fraud charges also claimed Yohannan doesn’t sit on boards of GFA affiliated organizations in India. And by the way, just so you know, I am not legally on any boards, any trusts, anything in any of these countries. I have no powers to make decisions or sign money, or release money, or make decisions, I am completely legally…why? Because anybody who work in the United States or overseas countries have a board membership or have legal membership should not be part of their legal entities in India. It’s a conflict of interest and therefore we send the funds and it is immediately under the government watch care and the government of India is responsible and investigative agencies and tax divisions to make sure that is carried out within the time frame or whatever they do, that is a public thing. In May of this year, attorney Robert Mowrey made the claim in an Arkansas federal court. Here is the big issue, and it doesn’t really have to do with bifurcation, but I think that the Court should give us some guidance on this today. If you look at their case management plan, we could go through. They have four pages, and we’re going to produce most all the things that they have asked for, except the problem that we have, Mr. Stanley [attorney for people suing GFA] has mentioned over and over how K. P. Yohannan just controls everything. There are many — there are entities in India: The Believers Church, GFA-India. K. P. Yohannan is not on the board of those entities. Is he the metropolitan? Yes, he is the Metropolitan of Believers Church. Does that mean he has access to all of their records? No, it doesn’t. Now, Mr. Stanley doesn’t believe that. Mr. Stanley thinks that whatever K. P. Yohannan wants, he can get; but we have no problem in producing everything we can with respect to the entities that he has sued. But when it comes to wholly separate entities in India, that’s where the rub is. In past articles, I have produced ample evidence that Yohannan is on the GFA (now Ayana Charitable Trust) board, the Believers’ Church board, the Bridge of Hope board, and the board of at least a couple of his for profit schools. 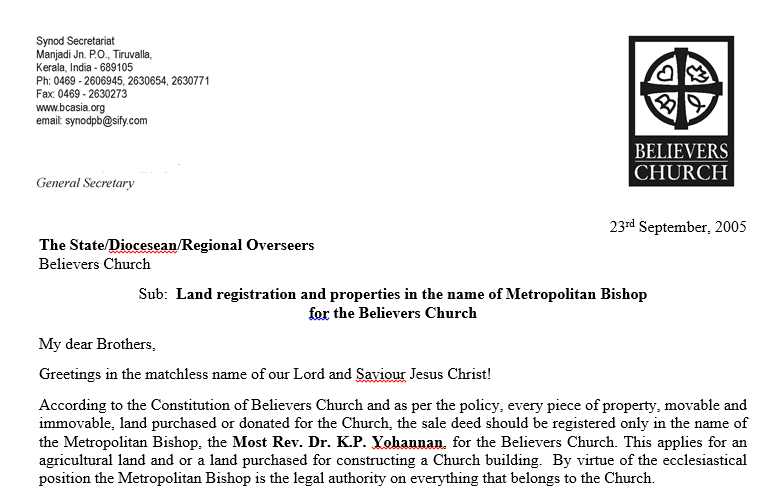 Yohannan is listed as owner on the deeds to property owned by the church. However, I lacked the trust document which established Believers’ Church in India. Now I have the original 1993 trust document and a trust deed updated in 2004 (click the links to read each one). Point 10 leaves no doubt who is in charge in the Believers’ Church. These documents show beyond any doubt that K.P. Yohannan is a founding trustee of Believers’ Church and that he remains in control of the business and religious operations. All of the NGOs operate under the umbrella of Believers’ Church and would provide documents for the court action in the U.S. if the Metropolitan Bishop ordered it so. The list of GFA trustees in 2004.